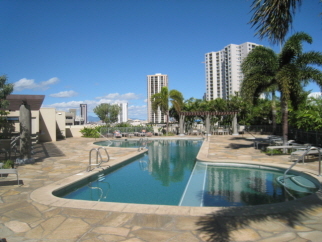 Located less than 1/2 mile from Ala Moana Shopping, Beach Park, Ward Entertainment, Neal Blaisdell Center and all that Kakaako has to offer. This high floor three bedroom offers flexible use for family or Boomer looking for a home office and guest room. Located on the cool side of the building and offers gorgeous city and mountain views. The office/3rd bedroom overlooks the coastline and harbor. Viking stainless steel, European cabinets, granite, limestone & marble. Long list of incredible amenities.